The most romantic day Valentine’s Day is upcoming, in FFXIV there is also a celebration, A Valentione’s Day. 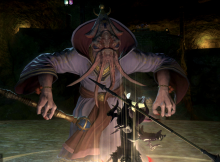 For FFXIV players, A Valentione’s Day is an event that can’t miss out, because it is a choice to find out “the other part of your heart”. Imagine that you encounter your love in FFXIV on Valentine’s Day, how romantic it is! Don’t miss out it! Maybe you don’t have to play alone.The buds of ardor and affection shall soon bloom, but who will receive the tender blossom that is your love? 1.Paramour Barding (Other): A gaudy suit of chocobo armor designed for use during Valentione’s Day celebrations. 2.Flame of Passion (Outdoor Furnishing): Outdoor lighting certain to heat up any relationship. 3.Valentione’s Cake (Tabletop): A decadent chocolate cake emblazoned with the House Valentione coat of arms. Cannot be retrieved once placed. 4.Prismatic Heart (Left & Right): This peculiar contraption creates illusions by weaving together myriad shades of light. Produces the other side of a heart. If you missed 2014 Valentine’s Day event, don’t miss out A Valentione’s Day 2015! In the loved day, FFXIV4GIL will still try our best to provide fast and safe FFXIV GIL to each player in need,happy Valentine’s Day !